There’s nothing particularly sinister about it, it’s caused by a bug that was in Windows XP. This particular bug was fixed with service pack 3, but not everyone has installed service pack 3. 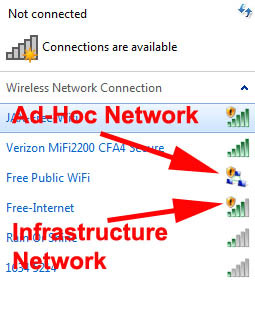 The more technically astute of you will see on some of the screen shots above, that this network is NOT an access point it’s an “Ad Hoc” network, this basically means you’re going to connect to to another computer. The whole thing started because when Windows XP could not connect to its favourite/stored wireless sites/connections, it sets up an “Ad Hoc” network with the name of the last network it connected to. 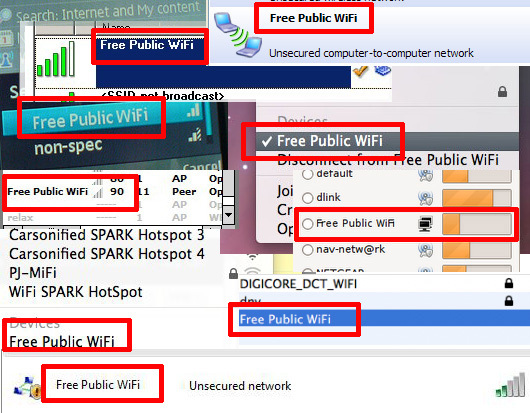 The “Free Public Wifi” network spread like wildfire as machines were all connecting to each other on wireless connections that were not what they was purporting to be. It seems that (like me) everybody likes free stuff. The same problem can occur with machines advertising popular access point names like linksys, netgear, default, tmobile, hpsetup etc as well.